Essence Carson, left, and Chiney Ogwumike battle for positioning at a game earlier this season. The Sparks and Sun are fighting for playoff seeding tomorrow. Chris Poss photo. 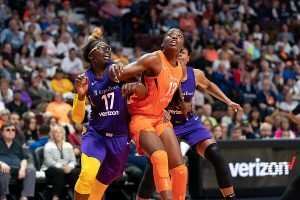 In this most competitive WNBA season, the No. 2 , No. 3, No. 4 and No. 6 playoff positions remain undecided going into the final day of the regular season Sunday. Seattle (25-8) is locked in at No. 1, with home court throughout the playoffs, and a bye into the semi-finals. Phoenix (19-14) is locked in at No. 5, even though they could finish with the same record as Los Angeles and Connecticut, due to the way the tiebreakers work. Minnesota (17-16) is locked at No. 7 and Dallas (15-18) at No. 8. Neither will have a home game in the playoffs. No. 2 Atlanta or No. 3 Washington will battle for those seeds, whether they reverse the current order or not. They change places only if Atlanta loses and Washington wins. Because No. 2 gets a double bye, these teams will go all out for the win. No. 4 Connecticut or No. 5 Los Angeles will finish at No. 4, depending on who wins tomorrow. The loser drops to No. 6, due to complex tiebreakers that require a look to the second level: wins over teams finishing above .500. Because the No. 4 team gets a one-round bye, and therefore only one single-game playoff round, this game is huge for both teams. 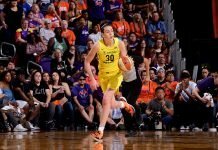 In the WNBA playoff format, the No. 1 and the No. 2 teams have the greatest advantage: they receive a bye into the semifinals, with a best-of-five format, and home court advantage. The No. 3 and No. 4 teams receive a bye into the second round single-elimination format, and home court advantage. No. 5 through No. 8 teams must endure two rounds of single-elimination games to reach the semi-finals. Higher seeds have home court in the each round.